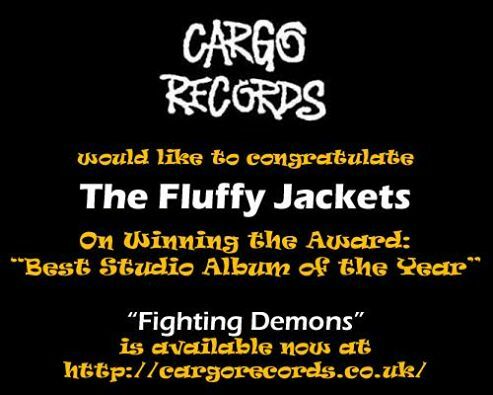 The Fluffy Jackets has won the Best Studio Album of The Year Award, voted by listeners of The Blues Hour radio show in the UK and France. 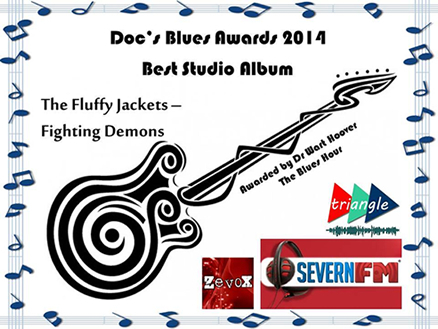 The award was announced by Radio DJ Dr. Wart Hoover of SevernFM in recognition of “the marvellous debut album” Fighting Demons. 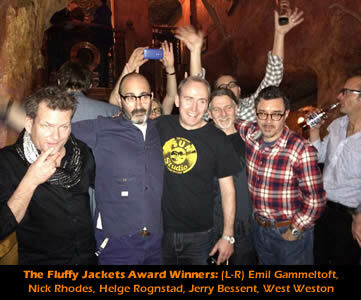 The Fluffy Jackets main man Helge Rognstad appeared on the radio show via a pre-recorded thank you speech, giving credits to the musicians who contributed to the album, including a special mention to producer / guitarist Manny Charlton "who gave me the confidence and belief that it was possible to fulfil my ambition of completing this album". Meanwhile, Former Dr Feelgood guitarist Wilko Johnson won the Blues Sensation award for his incredible comeback album featuring Roger Daltrey of The Who. The guitarist said he has been "cured" of the terminal pancreatic cancer with which he was diagnosed in 2012, after having had radical surgery to remove the tumour earlier this year. Trivia Question: Apart from being award-winners, can you guess what the connection is between the Fluffy Jackets debut album & the Wilko / Daltrey comeback album? Answer: Some eagle-eyed music aficionados may have noticed that both the Wilko/Daltrey album and the Fluffy Jackets albums employ the musical talents of one certain Steve “West” Weston, who is a harmonica player extraordinaire. West Weston features on The Fluffy Jackets album playing harp on the songs “Fighting Demons”, “Little Brother” and “Mean ol Frisco”. The Blues Hour is one of the top blues radio shows in Europe, underpinned by DJ Wart Hoover's undying appetite to uncover exciting new blues music from around the world. He is one of the very few DJ's to look underneath the cracks in the cement for new talent. Wart Hoover was the first person to play The Mighty Mojos on air, a band which subsequently received the honor of "Best New Blues Band of 2013". Want to play Fluffy music on your radio station? If you are working for a local (or national) radio station, and wondering how to obtain our album: please CLICK HERE to obtain your free Promo copy.